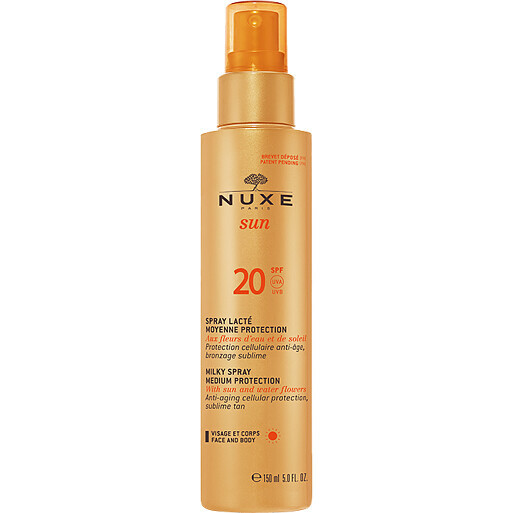 Ensure luxurious, comfortable protection every day with the Nuxe Sun Milky Spray for Face and Body SPF20, a medium protection sunscreen. Created for quick and easy application, the Milky Spray applies in a transparent mist, enveloping the skin in a non-sticky veil of moisture and protection. A cocktail of patented water flowers including Water Hyacinth and Kau Pe Flower ensure lasting hydration. The refreshing Milky Spray pairs powerful antioxidant protection with anti-ageing cellular protection, which stimulates repair and reduces the risk of photoageing. Natural carob seed powder works to activate your tan, stimulating melanogenesis while prolonging your natural tan. Ideal for all skin types in moderately sunny conditions. Apply in the morning all over the body, and apply every two hours during sun exposure. After use, skin is protected and scented with the addictive aroma of summer flowers and vanilla. Nuxe Sun Milky Spray for Face and Body SPF20 150ml is rated 5.0 out of 5 by 2. Rated 5 out of 5 by sunsail74 from lovely product & great service Very pleased with the product and the service received. Always a speedy delivery service, well packaged & complementary nail file in the parcel. I will recommend this site to anyone.